Holy crap, psychic much? 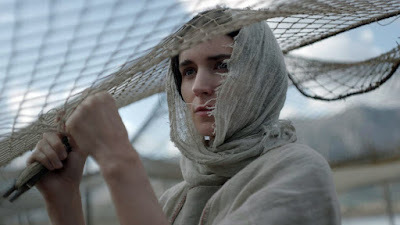 Me and a friend from AwardsCircuit.com were literally just talking about Garth Davis' long-delayed Mary Magdalene film over the weekend, and suddenly it has both a distributor and a release date. Time to play them lotto numbers. IFC Films has swooped in to rescue Mary Magdalene, which was Davis' anticipated followup to his Oscar-nominated drama Lion. For those who may have forgotten, the film was shot three years ago with Rooney Mara in the tile role and Joaquin Phoenix as Jesus Christ. It was to be released during Easter weekend 2018, but that was before the scandals surrounding Harvey Weinstein exploded, The Weinstein Company was destroyed, and that was basically it. So now IFC Films has picked up the rights with plans to distribute it into theaters on April 12th. There was a lot of awards buzz surrounding the film before, and we may be looking at a surprise contender's early emergence.